In the “Golden Age” of Baseball—the 1950s—no two ballplayers personified the era more completely than the New York Yankees Mickey Mantle and New York/San Francisco Giants Willie Mays. Baseball fans and historians know this with resolute clarity. Through the years books, songs, movies, and theatrical performances have been inspired by Mickey and Willie. Mickey and Willie were two-thirds of a triumvirate (Duke Snider of the Brooklyn Dodgers was the third) of centerfielders who patrolled the outfields of Yankee Stadium and the Polo Grounds (Snider played at Ebbet’s Field) and made New York baseball legendary in the years following World War II. Mr. Barra takes readers on an interesting journey to the Midwest and Commerce, Oklahoma, as well as through the Deep South of Birmingham, Alabama, to show you how life for “Mick” and the “Say Hey Kid”—though culturally different—was very much alike. Both young boys’ fathers saw baseball as a route away from country living and onto the big stage of the Big Leagues. Neither Mantle’s or Mays’ father was secretive about his desire for his son to develop their baseball skills in order to escape the blue collar life both men experienced. Despite the Jim Crow laws of the South, in some respects Barra paints a more idyllic life for the young Mays. Days that were filled with perfecting his craft as a teenager, Mays’ athletic prowess seemed to shelter him from more salacious racism that was the norm of the day. Mantle’s father was a coal miner and he did not want his son following his footsteps down the mines in Commerce. Mutt Mantle came home each day and practiced with his son Mickey, making the young prodigy swing from the left and right sides of the plate. It wasn’t long before Mickey developed his skills to the point where people took notice. Mr. Barra’s parallel storylines give readers a side-by-side comparison of Mantle and Mays fans of baseball have never seen before. While the author is quick to point out obvious differences in the two superstars—their race being the primary difference—Mr. Barra also brings to light how much the two men were really alike. This aspect of Mickey and Willie will leave readers fulfilled by the end of the book. Most baseball fans can recite the statistics and World Series played and won by both Mantle and Mays. This book delves deeper into a seemingly complicated relationship between two New York superstars that really wasn’t all that complicated. 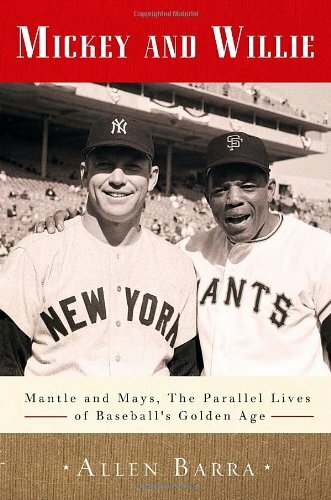 In the end, Mantle and Mays were two boys who grew up loving baseball, learned to play it in the country, and perfected in the bright lights of Manhattan and San Francisco. Tom Caraccioli is the co-author of Striking Silver: The Untold Story of America’s Forgotten Hockey Team and Boycott: Stolen Dreams of the 1980 Moscow Olympic Games.